This is a much needed addition to nursing's arsenal of policy books. It is the first to really examine the need for scientific evidence to underpin policy. The two editors are pioneers in research and have led nursing research to new levels. It is fitting they do the same in underscoring the important role nurses have in using their programs of research to develop policy agendas.Score: 94, 4 stars --Doody's A must-read for health care policy makers, as well as nursing students, faculty, and professionals, this groundbreaking text provides actual strategies for translating nursing research to health policy at all levels of policy-making. The editors, both leaders in nursing research, provide key findings from research programs that have positively influenced health policy decisions and programs at community, state, national, and international levels. 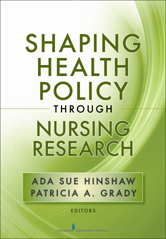 The first compilation of information linking health policy and nursing research, this text presents perspectives and frameworks for understanding the processes bridging research and health policy; multiple factors influencing the processes; and actual examples of National Institute of Nursing Research (NINR)-funded research that has influenced health policy programs.